Dolphins are marine mammals related to whales and porpoises. 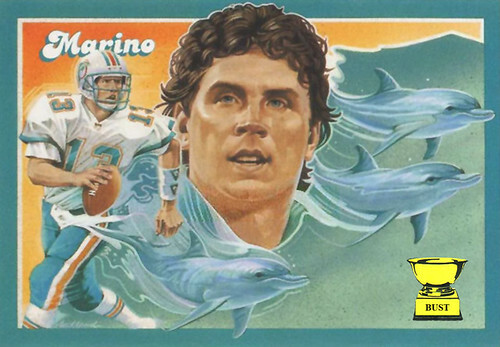 Dolphin Dan Marino was a land mammal who never had relations with a "whale" on purpose. Dolphins are often regarded as one of Earth's most intelligent animals. Dolphin Dan Marino was rarely regarded as one of the NFL's most intelligent players. Dolphins communicate using a variety of clicks, whistle-like sounds and other vocalizations. Dolphin Dan Marino communicated using a variety of clicks, whistle-like sounds and other vocalizations. Dolphin copulation usually begins belly to belly, and many species engage in lengthy foreplay. Dolphin Dan Marino's copulation usually begins with Winner's Cup Vodka, and he sneers at the second part of this sentence. Dolphins have long been a favorite of popular culture, appearing in TV series such "Flipper" and "SeaQuest DSV." Dolphin Dan Marino has long been a laughingstock of popular culture, appearing in movies such as "Ace Ventura: Pet Detective."